The Luke DP976 is an ideal emergency radio that can operate from four different power sources! This economy receiver has a built-in windup dynamo generator and a built-in solar cell. Conventional operation from two AA cells (not supplied) or external 3 VDC source is also supported (AC adapter is not included). 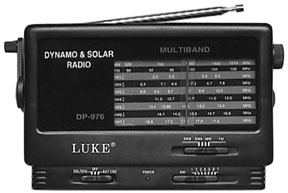 The Luke DP976 receives AM and FM plus these shortwave bands: 5.3-5.5, 5.9-6.2, 6.4-6.7, 7.1-7.5, 8.6-9, 9.5-10, 10.7-11.1, 11.5-12, 12.8-13.1, 13.4-13.9, 14.4-14.7, 15.1-15.6, 16.8-17.1 and 17.5-17.9 MHz. Other features include: power LED, mono earphones and wrist strap. 7.25x4.5x2.25 inches 1 Lb. Copyright 1999-2005 Universal Radio, Inc.